I’ve made this Easy, No Fail Turkey Meatloaf a dozen times over and it really is no-fail. It’s soo easy and my family loves it! It always turns out perfectly moist and flavorful even though there’s really not much that goes into it. We made this last week so I updated the photos and I’m honestly not sure it looks any better! But let’s be honest, meatloaf just isn’t the prettiest thing to come out of the oven. But dang it’s tasty. 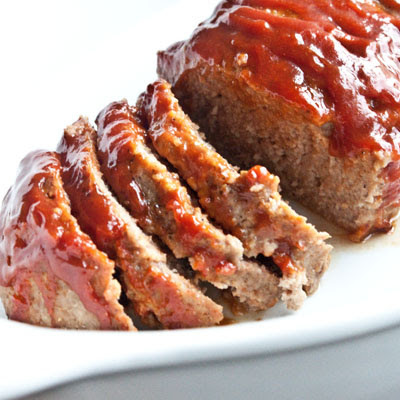 If you’re not a fan of meatloaf you gotta give this one a try! I always use ground turkey but you could use lean ground beef too. And I often halve the recipe for my family, it makes one bread-pan size loaf. I’ve also used ground oats or quinoa, or a blend of the two instead of bread crumbs–totally works too! Preheat oven to 350. In a large bowl combine the turkey burger, egg, onion, milk, bread crumbs, and salt and pepper (I use my clean hands to combine). Using hands form into a loaf and place in a lightly greased meatloaf pan (bread pan). Sprinkle top with another dash of salt and pepper. In a separate bowl combine brown sugar, mustard and ketchup. Pour over the top of the meatloaf, spreading evenly. Sprinkle a little bit of brown sugar over the top of sauce. Cover with foil and bake for about one hour or until cooked through. *** I double the sauce recipe and save some for those of us that like to drizzle a little extra over each slice! Just put my meatloaf in the oven. I can’t wait to eat it. I added green pepper and some garlic to the mixture. Ooh love the addition of bell peppers! Hope it was great! This is the same receipe I’ve been using for years!! Yummy..only difference is I use 1 lb ground beef then add BBQ sauce to sauce mixture! Whole family loves it! Much healthier to go with the turkey and ditch the beef! With any meatloaf recipe I like to hard boil 3 eggs, peel, then add to the center of the loaf, lined end to end. Its so pretty when you slice to serve and very tasty as long as you like eggs. Made this last night – but with way too onion! I highly recommend erring on the side of less rather than more onion, especially when dealing with a jumbo one like I was! The first time I made this, I thought the same thing. The second time I used the same amount of onion but chopped up very finely and mixed with the egg first. This way it was much more incorporated without giant chunks of onion everywhere. I thought it was so much better this way. I used jarred garlic instead of onions. I didn’t have any mustard and didn’t use that much milk or breadcrumbs, I added parsley and Italian seasoning. I’ve followed the instructions, I’ve had the drain it twice and it’s now pushing two hours for cooking. Starting to have my doubts. Cooking now and it’s been almost 2 hrs? How can the temp/cook time be so off? If I only have 1lb of turkey should I cut the recipe in half? I would halve everything but the egg, it’ll make it nice and moist!! You could probably halve the sauce too, unless you like a lot of it:) we do!! This same recipe was made for us when we had our 3rd baby. I fell in love with meatloaf at that time. There is NO OTHER meatloaf that beats this one. I use ground oatmeal instead of bread crumbs (hubby is lactose intolerant and lots of bread crumbs has cheese in it). I must say this is the only meal that ALL of my kid gobble up EVERY time I make it. DO you use just yellow mustard or is prepared mustard something different? thanks! found on pinterest tonight, I had turkey and didn’t know what to do w/ it! The whole pan was gone – it was GREAT! I used Italian panko bread crumbs, didn’t have onion used a couple shakes onion powder and only 1 lb of meat, so I cut the milk in half. it turned out great. Do u usually use plain bread crumbs? The sauce was very good! It will be a regular at our dinner table! The only thing I halved was the milk and it turned out perfect. I usually do ground beef meatloaf, so I kinda knew what consistency to have. Love it! The meat was very moist and the sauce was good. I’ll decrease the onion and brown sugar but definitely plan to make it again. Thank you so, so much!! My daughter has a milk allergy…do you know if I can substitute the milk with hemp/soy milk??? Soy milk works perfectly with this recipe. My son is highly milk allergic and he can only use soy milk. The only caveat I have is perhaps cut back slightly on the brown sugar if your soy milk is already sweetened. I used cashew milk, and it came out great. In the oven as we speak! Can’t wait to taste this meatloaf. Do you cover the dish while cooking? It really needs to be brown sugar, at least I think. I’ve never tried it with regular! Great meatloaf. I love that this recipe doesn’t require the onions to be saute. I normally make Barefoot Contessa’s turkey meatloaf but I was out of chicken stock. I added minced garlic, dried thyme, and Worcestershire sauce for added flavor. P.S. I totally agree that meatloaf is difficult to photograph. I love quick and easy recipes! My meatloaf is in the oven as we speak! I hope it turns out tasty!! Thanks! I forgot milk!!!!!! Will tht make a difference in my meatloaf????? i’ve seen recipes without milk so it might be fine! 350, sorry I’ll add it in the recipe! What sides go with meatloaf?? Mashed potatoes, or twice baked potatoes, roasted asparagus, just a side salad…you can’t go wrong! This is my first time to make meatloaf of any kind. I used ground beef with 8% fat and I’m wondering if that is lean enough? It’s been in the oven for over and hour and it seems very, very watery. I actually took it out twice and poured liquid out of the edge of the pan and then put my oven onto convection to try to cook it out. Any idea where I went wrong? Still smells amazing and we will give it a go for sure, but I didn’t think it was supposed to swim! Ground beef should work okay too, draining is the right thing to do. Ground beef does create more juices than ground turkey. The other thing you can do is add some more bread crumbs to see if that helps absorb some of the moisture when cooking. Did it turn out okay, or taste good for you? So good to hear!! Thanks for letting me know Everly! Just put this in the oven. It smells amazing. I don’t like beef very much so it was nice to see that this is made with lean ground turkey. Can’t wait for supper. Thanks for the recipe! Thank you again! And keep on cookin’! So glad you liked it Shannon!! It’s one of our go to’s, it’s so easy and turns out good every time:) Glad the little one liked it too! THANK goodness for the internet and THANK you for posting this amazing and SUPER easy recipe for turkey meatloaf. The smell of it cooking in the oven was awesome,and taste was even better – so delicious. Thank you for sharing this, Kristy! I will be posting a review of this recipe on my blog sometime soon and of course, giving you mad props. I am going to make it again this weekend. Have a great day! Thank you Janice!! I’m so glad you liked it! It’s super easy and always turns out!! I am preparing the meat loaf, but do you cook it covered or uncovered? Covered! I’ll add to the instructions! I used your turkey meatloaf recipe and added a 3-cheese to the mixture (a blend of parmesan, Romano, and asiago). I’m cooking it now. It’s almost done. I’ll let you know how it turns out. Oh, and I double the sauce because the Mr. loves sauce. Oh my goodness, it turned out scrumptious!!! Thank you for sharing. So tasty! The cheeses were not overwhelming; I think it just added to the texture. So yummy and moist. I think the milk helped with the moisture. I mixed half ground turkey and half lean ground pork. Next time will add bell pepper to the mixture. As is was delicious! Made this for dinner this evening , it was delicious. We ate it with a side of cauliflower mash. Can oatmeal be used in place of bread crumbs? I’m going to give this a try tonight. Could I please have some tips on freezing n re-heating this? Thanks! I made this the other day with my kids – delicious! I used 1 cup of oats instead of the bread crumbs and it was just fine. Leftovers were even better! Very easy, family-friendly recipe. I’m going to make this tonight. Got some ground turkey and wasn’t sure what I was going to do with it and I’ve been wanting meatloaf, just haven’t been able to make it because ground beef (I think the fat) is making hubs sick lately…I’ve even used 93/7 or whatever the most lean one is and it still makes him ill. So, i was told to make it with the turkey, but to add ground beef to it or it will turn out like a dry log, I am glad I found this recipe because he really didn’t want me to add ground beef to it. I’ll let you know how we like it 🙂 Thanks! I just made this recipe tonight and my very picky boyfriend even said it was delicious! He doesn’t like mustard, but I used it anyways and he said he couldn’t really taste it. Thank you for a great recipe to use up some turkey I had in the freezer! Can you use regular bbq sauce if you dont have ingredients for the sauce? Do you have to use mustard? Is there a substitution or will it still taste good if I skip that ingredient? I like the flavor the mustard adds to the sauce, but you could try it without it! You could do bbq sauce instead of the homemade sauce too! How should I freeze this? Prior to baking? What’s the thaw time? Making for a friend who just had a baby. Thanks! Just put it in the oven! I have 20 mins left. Can’t wait to see how this turns out. The sauce was already scrumptious lol. Thank you for the recipe. can I use a bread pan instead of a 9×13 pan? I made this tonight and everyone enjoyed it. I added fresh chopped italian parsley, dried thyme, worcestershire and garlic powder. Delicious! Hello–Making this tonight–it says to grease the pan but to also cover with foil…Do i cover all the ground turkey in foil and cook it? You want to place the log of meatloaf on a greased baking pan (9 x13) and then cover the pan with foil. I used the meatloaf recipe, but made my own sauce-1/2 cup sweet baby rays barbeque sauce, a squirt of Dijon and yellow mustard, 1/2 cup brown sugar, and three shakes of Worcestershire sauce. It is SOOOOO good!! So glad you liked it, your sauce sounds great! Found this recipe on Pinterest the other day. Such simple ingredients – I had everything on hand. I made exactly as written and it came out so good. I’ve never used milk in meatloaf. I think that made a huge difference than using just the egg for binding. Excellent use of ground turkey! Thanks ! Glad you liked it Sheri! And yes, the milk keeps it very moist and holds it together perfectly! Question- Why do you suggest the use of a 9×13 pan vs a standard Loaf pan usually used for meatloaf? I like to make a longer loaf! You can definitely use a loaf pan! Can I make this a night ahead and keep in fridge until ready to bake? Made this for dinner last night and it was delicious! I did make a couple changes… I added a couple cloves of garlic (because, well, garlic!) And I used quick oats instead of breadcrumbs simple because I’ve discovered I like the texture better when I make meatballs and such. It was extremely moist so I might try cutting back on the milk a little next time, or maybe just extend the cooking time a tad. Great suggestion on making a double batch of sauce because the sauce is delicious!! This is definitely a keeper! Thanks so much for this recipe! It’s currently in the over now (smelling scrumptious). I took it out to check it and there was a ton of liquid in the pan. Is that normal? I drained it and popped it back in the oven for a few more mins. I was wondering if you uncovered it for the last 15 minutes maybe? My sauce isn’t crystalized like you mentioned either which excited me :)) I’m hoping uncovering for a few mins will do the trick! I hope it was yummy! Yes, you can drain it if there’s too much liquid. I’ll make a note of maybe uncovering for the last few mins if the sauce doesn’t crystallize! Thanks Barbara! Can you use egg whites instead? I haven’t tried it but I’m sure you can! Maybe just double the amount of egg whites as eggs! I hope it turned out! It shouldn’t take two hours! I am making this for the second time tonight. It is so delicious my family “LOVED” it. Thank u so much for the recipe. Will definitely continue to make this from here on out. I was worried about not liking it because it’s made with turkey meat vs hamburger meat, but u can’t even really tell the difference except it taste way better so everyone that is skeptical don’t be try it you will like it. I”m so glad you liked it!! It seemed too loose for me so I added more breadcrumbs and a pinch of sage. My great granddaughter is visiting and requested I make meatloaf. This is my first turkey loaf, I’ll let you know if she approves. I’m so very disappointed by this recipe. I feel like I just wasted a ton of ingredients. It ended up like complete mush with raw onions thrown in….kind of reminded me of wet dog food consistency. Won’t be trying this again. Sorry you had such a bad experience! Most people have loved it, but thank you for letting me know! I added minced garlic, used cashew milk, and omitted the mustard in the sauce, and it was delicious! OMGoodness this was so good and so easy! I have made this twice and both me and my fiancé love it! I want to make it tonight but it looks like the recipe is missing off of the post! Is the recipe missing?? It doesn’t seem to be popping up and I can’t find a link if there is some other page I need to go to. Hi Chelsea, sorry. For some reason all of my recipes aren’t showing up after moving to a new domain today. I have someone Working on it right now!!! I have this in the oven now. Can’t wait to try it, it smells so good! Thank you for the recipe! You’re welcome!! Hope it turns out well for you! My niece who is picky about every thing, my mom who usually tells the truth about my cooking they both loved it. The sausage was delicious, but I didn’t use milk, and I added 1 teaspoon of soy sauce 1 teaspoon of red wine vinegar. It was delicious. Making it again today. This was the best turkey meatloaf I have ever had! The sauce was so amazing and it what made it so great! Thanks so much for sharing! Made this tonight and was super disappointed. As mentioned in a few other posts, it was wayyyyy too mushy and soggy. I even uncovered it and tried cooking it longer than recommended. I ended up not even bothering to eat it. Could have been a lot better if adjusted to be made with less liquid. so sorry, it’s turned out so well for others! Its’ hard to know what went wrong as every kitchen/oven is different! Okay I’ve made this recipe TWICE and both times it was mushy and awful, but I’m determined to figure out what’s wrong because all these reviews are fantastic. I think I’ve figured out an issue. When I see this recipe through Pinterest, it says to use 2 3/4 cup of breadcrumbs, but here on the site it says to use 1 1/4 cup. I used the lesser one and it was so liquidy and milky, I baked it for 2 hours so it would be solid enough to try and eat. Next time I’ll add more breadcrumbs and see if that fixes it. If not, I give up! I want to like this so bad! Is the sauce just the sugar, ketchup and mustard or do you use actual red sauce too? I’d suggest adding a little extra breadcrumbs and cooking it longer! I have made this now for years. I too double the sauce recipe. It’s super simple and easy! I even substitute some of the bread crumbs for whole wheat flour and almond crumbs. Yummy! So glad you liked it!! And way to still be cooking in the kitchen!!! If you make extra sauce do you heat the extra sauce? Or put it on cold? I heat it in a saucepan! So far it smells amazing! I wanted to try something new and stumbled on this recipe. Was happy I had every ingredient. Saving the sauce for after it is done,my 12 yr old had to try it. Said best sauce he every had. Made this tonight just trying to clean out the fridge… This is the perfect recipe because it’s stuff you already have in the pantry. I did add a few extra: 1/2 a carrots shaved and diced, spinach, & a can of green chili peppers- drained. Also because all these added more “wetness” factor I added an extra 3/4 cup more bread crumbs. Lastly since I didn’t have a baking tin for a meat loaf I balled it & made them into meatloaf muffins. Perfect serving size & easy meal prep for lunches the next day. ???? Awesome! So glad to hear!! Yes best & easy meatloaf recipe! Ohhh & the sauce… So perfect!. Had to make triple, yes that good. The boyfriend ate almost 1/2 the meatloaf in 1 sitting! Thanks again! Hello! My meatloaf is in the oven and has been cooking for a little over an hour…. Has anyone else’s turned out a little mushy? Or should I keep cooking it? I think you meant use one meatloaf dish not a 13×9inch pan. I used 2 meatloaf pans because i was confused with that. I think you shoukd say use one meatloaf pan. Okay thanks, i will change that! I had ground turkey meat in the fridge…and was trying to figure out what to do with it so to Pinterest I went! I made it last night….with some adjustments. I had just under a cup of bread crumbs but read about substituting the rest for finely chopped mushrooms…added chives, and I didn’t have brown sugar…just regular raw brown sugar…So i used that instead. I didn’t have Ketchup so I used honey mustard sriracha (sp) sauce and sweet chilli sauce mixed together for the sauce…a little spicy/sweet. It was great! My husband loved it and even my in-laws who are picky with stuff outside of Macedonian foods… (I’m an expat living in my husbands country, Macedonia). We didn’t even have leftovers! Sorry so long! but thanks for posting a simple and easy to follow recipe! Your welcome!! thank you Pea! Wow! It’s so yummm.. I’m gonna try this tonight!